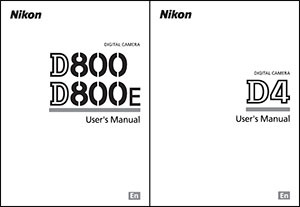 Nikon has posted the manuals for their latest D4 and D800/D800E DSLR cameras on-line. So if you want to know all about these great cameras before you go and buy them (or just want to see what they're all about). Be sure to have a look at these manuals. Or you can go to your local Nikon support site and download the localised manuals from there.